It's time to spice things up! You really don't want to miss out on our latest extra thick issue. A genuine collector's item, we've added 16 extra pages with lots of exciting content for you to get inspired. The perfect gift for loved ones or treat yourself to many hours of happy browsing. Pulling through yet another harsh winter will be a breeze! Famous yarn artists such as Molla Mills and the founders of We Are Knitters share with us their secret to success. We also want you to meet our favorite interior architects, they call themselves XandL - in short, they are visionaries. Find out for yourself by taking a peek behind the curtain of their Amsterdam atelier. Have you ever tried mixing your silky soft roving wool with a carder or blending board? Well, we have, and you'll see the results of our pre-spinning efforts inside. We also tried our hand at abstract and crewel embroidery. Free style needlework is simply amazing - you never know where your project will lead you. Punch needling? Naturally, we have three different patterns to keep you busy for weeks. And if weaving is your forte, you'll find our finely woven table runner design a perfect new adventure! 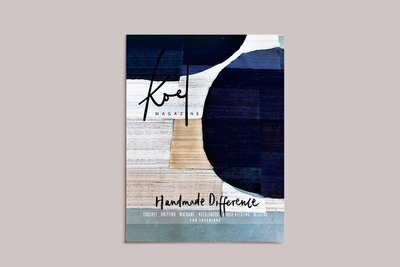 Especially for you - we collaborated with some our favorite brands, such as Tia+Mia, Temaricious and Elytra Textiles, to bring you a series of unique KOEL limited edition products. Think yarn-stash shopper bag, hand dyed threads, lucky tassels and many more yarn goodies. Oh, before we forget, we brought the finest Khadi fibers with us all the way from India. Now, if nothing else, that will really get you in a festive mood.